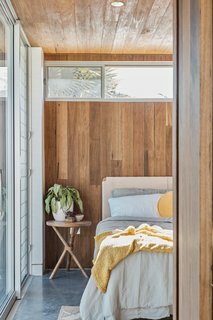 In the coastal town of Byron Bay in New South Wales, Australia, local practice Harley Graham Architects elevates the Australian "garden studio" with this 646-square-foot granny flat. Named Marvel Street Studio, the guesthouse is an addition to a home designed by Paul Uhlmann. 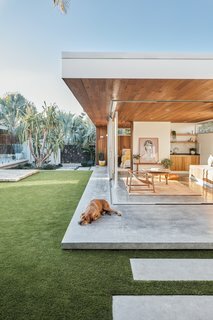 The architects created seamless connections between the existing home's patios, the lawn, and the garden spaces by giving the studio a transforming envelope with a wide-open corner. The studio is set upon a floating concrete slab. The wood-wrapped facade provides passive cooling through cross ventilation. A "Lo Chair" from jdlee Furniture. 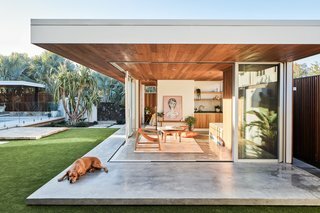 The architects refer to the studio's form as an "operable pergola." The building provides an externally accessible toilet, an outdoor shower, a basin, and storage that can be accessed by residents of the main house without disturbing guests residing in the studio. 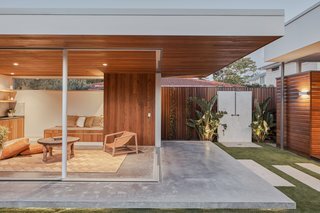 The studio's program is divided between a pergola, an outdoor refuge, and an entirely self-contained separate granny flat. 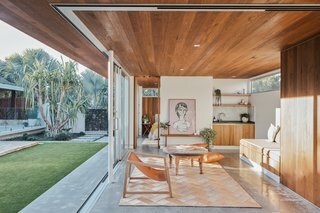 "The Studio’s form adopts a midcentury influence to complement the existing Paul Uhlmann-designed dwelling, and is shaped to function effectively in a subtropical climate," says the practice’s founder Harley Graham. 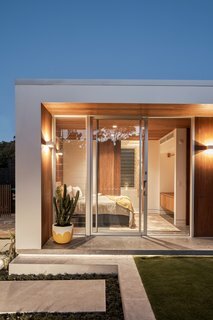 The design team also added a small pool cabana to the studio to further unify the architectural elements of the backyard. Concrete floors keep the interior cool in the summer. 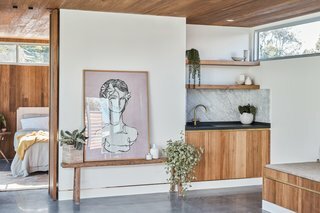 The self-contained studio is well suited for the Australian indoor-outdoor lifestyle, and it can function as both a private quarters and a shared social space. A wash basin with a marble backsplash. 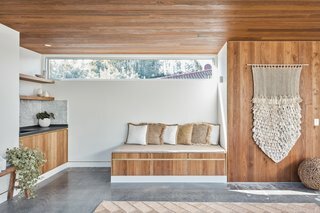 "This garden studio provides the opportunity to inspire and influence an increased public utilization of the backyard studio typology—creating sustainably interwoven suburban communities with increased outdoor amenity through operability, and an improved sense of connection within and between singular lots," says Graham. 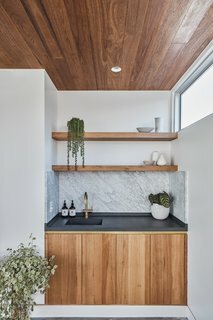 The "Australian tallowood" cladding and joinery is sourced from Eucalyptus microcorys trees. The studio features clear anodized window and door frames by AWS Australia. A concealable door can partition off the bedroom as a private unit. Wood details add warmth to the space.